The Costume Society’s annual conference will be held at The Artworker’s Guild on 1st and 2nd July 2017. Here we introduce our distinguished keynote speakers, Professor Aileen Ribeiro, Lindsey Davis and Susie Lau. Professor Aileen Ribeiro: Fashion and the Five Senses. Professor Aileen Ribeiro is well-known to most of us. As Emeritus Professor and previously leader of the History of Dress MA course at the Courtauld Institute (following Stella Mary Newton), and author of many influential books on the subject, she is internationally renowned as an authority on the history of dress. As an advisor for Costume, it is fitting that Aileen should be invited to speak at this year’s conference, celebrating 50 years of the Journal of the Costume Society. Those of us who have attended her lectures, avidly read her books and consulted her articles, or have been trained by her as a student at the Courtauld will be looking forward to her talk at Writing Fashion, entitled Fashion and the Five Senses. Aileen read history at King’s College, University of London and received an MA (1971) and Ph.D (1975) in the History of Dress from The Courtauld Institute of Art. She has been a lecturer in the History of Dress Section since 1973 and professor in the History of Art since 2000, she is now Emeritus Professor. She sits on the boards of the British Art Journal and Costume, the Journal of the Costume Society. 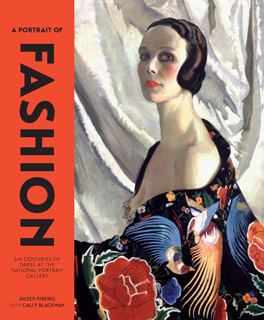 She has written and published many books and articles on various aspects of the history of dress, and one of the most recent (with Cally Blackman) is A Portrait of Fashion (National Portrait Gallery 2015). Gainsborough and the Modern Woman. Aileen Ribeiro has also held the role of governor of the Pasold Research Fund, which promotes the study of textile history, and has been elected a member of the Advisory Council of Sotheby’s Institute of Art. We are delighted to welcome Professor Ribeiro to speak at our anniversary conference. A Portrait of Fashion will be on sale at the conference at a special discount price to delegates. Go to our conference page to book your place.